Hi Fitness level is required. If you want to experience the most from this trip, you should be able to jog for at least a mile without stopping, balance on one leg for at least 60 seconds. There will be a fitness test before being allowed to join for a few of our adventures on this trip. We will spend a total of one to two days over the 15 day journey working on a social project changing peoples lives and supporting the eco system. Every trip over $1,500 of your money goes into making big changes, and we hope that you will help us to raise money for the cause through the support of your friends and family. High end Boutique 4 star accommodations paired with rustic village stays: Whatever it takes to get you in the mix and connected with the people. You will always have a luxurious meal and often a great massage to look forward to after digging deep into a cultural experience. Pampered and rustic Experience. We will be in both wealthier urban areas and poorer rural areas. You will be spoiled with massages, intimate boutique hotels, and fine dining (included). You will also get to stay with the people, often featuring a night or two home stay with the locals. These safe but down to earth experiences remind us what we have, and how people with so much less live often with so much more peace and happiness. These trips allow you to see what other tour groups never will, giving you memories you will have for a lifetime. Isn't it worth it to sacrifice a little luxury for a life experience? 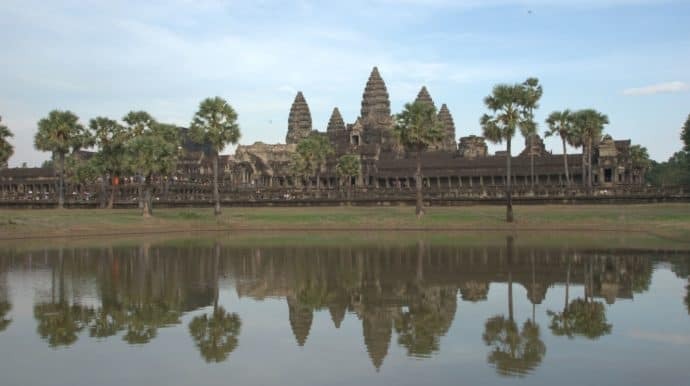 Cambodia offers the largest Buddhist temple monument in the world, incredible food, and Non profits where we can make a huge impact. Dive in, and prepare to have all of your senses engaged. Our trips are almost all Inclusive with most meals being served most days. Unlike the other guys, we believe you should focus on the experience, not making change. Sumatra and Cambodia. Two amazing countries to adventure through. Travel like a local in this unique adventure that is simply not offered elsewhere. We spent weeks on the ground on multiple scouting trips to create something truly exceptional. We discovered 4 star boutique properties not bookable online, Sourced the best restaurants in the countries, and enlisted engaging local guides that bring you into the heart of these entrancing regions with trekking itineraries guaranteed to put you face to face with Orangutans in a natural but safe environment. This custom curated intimate adventure has no more than 15 guests in order to blend in and build community. Ask us about Joining for Just one leg: Either Cambodia or Sumatra if time or funds are a concern. "Jud and Steve did a fabulous job on my recent tour with them to Myanmar and Sumatra. They really listen carefully to our desires and are open to making any adjustments in their planned itinerary to give everybody everything they want to experience. For example, the main reason I signed up for the trip was to photograph the ancient temples in Bagan. Well, following a less than stellar sunset shoot at the temples on our last night due to weather, even though we were flying out about 10 AM the next morning, they scrambled and put together a sunrise shoot that turned out to be mind blowing incredible! I’m so thankful for that ?? and it remains as one of my top two memories of the trip. All along the way we stayed very comfortably in great hotels and ate wonderful local food. So, thanks guys, we’ll definitely do it again!"